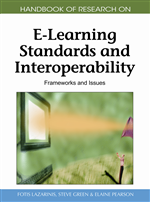 This chapter introduces a standards-based and adaptive framework whose main objective is to adapt user interfaces, content and learning environment to learners’ needs, including their functional diversity issues (i.e., disabilities). The framework is intended to be general (e.g., two different learning management systems and two large pilot sites are being considered) and to that end it is implemented in terms of an open architecture, which aims at providing services for Accessible Lifelong Learning. The chapter focuses on accessibility and adaptation issues, and their interoperability requirements. The covered topics are the required standards, interoperability requirements of the architecture, user model, recommender system, and their application to the end-user services that are being implemented at UNED University, one of the large pilot sites of the EU4ALL European project. Some of the challenges and solutions provided are discussed as well as the future work of related research areas. Learning ideally should be a personalised and adaptive process for all, which from the beginning to the end must consider the learner’s specific needs and preferences. Regretfully though, students with specific needs, such as those with functional diversity issues (i.e., the so-called disabilities), have problems in accessing learning because of the diverse barriers that may exist in the various stages they must go through to realise their learning or teaching goals. In fact, while many physical barriers have been removed in Higher Education (HE) Institutions, Information and Communications Technology (ICT) services are still not fully accessible to an increasing number of students whose main educational option is distance learning. Actually, accessibility, adaptation and learning are three interrelated issues with a growing interest in our society (Iorio, Feliziani et al., 2006; Kelly et al., 2007, Lanzilotti, Ardito et al., 2006; Seale et al., 2008). For that reason, European level initiatives, especially the Lifelong Learning (LLL) Programme (LLL Programme, 2006), promote and regulate actions to enable the conditions for everyone to take part in the information society. The main goal is to bring about “services, procedures, and information in an accessible way for every person”, assuming that “e-learning products and methods are able to take into account individual needs and learning-styles, and that they are not based on a ‘one size fits all’ philosophy, in which learners are seen as standardised ‘units’” (eLearningPR, 2004). A wide range of international and national legislations support individual rights and attendance to functional diversity issues. To name but a few, in Europe the E-Government-Law in Austria; Equal Status Act in Ireland; BITV in Germany; LSSICE in Spain; SENDA in the UK, etc. (WAB Cluster, 2009), the well known ADA in the US, and needless to mention the relatively recent International Convention on the Rights of Persons with Disabilities, which remarks in its article 24.5 (Education) that “States Parties shall ensure that persons with disabilities are able to access general tertiary education, vocational training, adult education and lifelong learning without discrimination...” . Despite available legislation and expected benefits from student-centred approaches in HE, leveraged by the European Higher Education Area (EHEA, 2009), from enrolment to assessment, students have to negotiate pre-established general procedures. These procedures are nowadays mediated mainly by technology (EUNIS, 2009) and intended to fulfil a “standard” set of needs but are far from considering the students’ individual needs and preferences. In fact, it is disturbing to note that the most basic requirements of people with disabilities are usually not attended in HE (Seale, 2006), and very often it is due to the unavailability of information before-hand, the lack of pre-established procedures to attend particular needs and the multiple and diverse barriers that have to be overcome to provide the required infrastructure (Cooper et al., 2006). Adaptable: Systems that allow the user to change certain system parameters, and thereby adapt the behaviour of these systems (Fink & Kobsa, 1998). Accessibility: “The usability of a product, service, environment or facility by people with the widest range of capabilities” (ISO TS 16071). Adaptive: Systems that adapt to users automatically based on monitoring the users’ interaction during runtime (Fink & Kobsa, 1998). Adaptability and Adaptivity at the User Interface: This focuses on improving the overall access to the information system and includes special I/O devices (e.g., macro mouse, Braille display, and Speech synthesizer), visual and non-visual interface objects, and associated interaction techniques (Fink & Kobsa, 1998). Universal Design: or “Design for All”: “the design of products and environments to be usable by all people, to the greatest extent possible, without the need for adaptation or specialized design” (Center for Universal Design, 1994). Assistive Technology: Has been defined as “technology used by individuals with disabilities in order to perform functions that might otherwise be difficult or impossible” (National Center on Accessible Information Technology in Education, 2006), or, more formally in the Technology-Related Assistance for Individuals with Disabilities Act, as “any item, piece of equipment or product system, whether acquired commercially off the shelf, modified or customized, that is used to increase, maintain, or improve functional capabilities of individuals with disabilities”. The term is used here to refer to products that interoperate with mainstream, “nonassistive” products to permit disabled users to perform the functions of the mainstream products. Adaptability and Adaptivity within Hypermedia Pages: This focuses on personalisation and includes the adaptation of the information content, information modality, information prominence, orientation and navigation aids, and links to other hypermedia pages (Fink & Kobsa, 1998).